Rescuers have described how they helped competitors enveloped in blizzards during the closing stages of one of the country’s toughest races. The Spine is an ultramarathon run over the entire 431km (268-mile) length of the Pennine Way, from Edale in Derbyshire to Kirk Yetholm in the Scottish Borders. Runners have a week to complete the route over some of the toughest terrain in England. But this year the elements threw in an extra challenge for the ultrarunners, with many dropping out in the severe winter conditions. 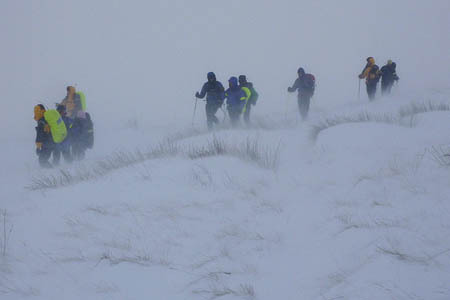 Border Search and Rescue Unit was involved in rescuing competitors in the final stages as the weather deteriorated on the north Pennine and Cheviot hills. The volunteer team’s press officer Damon Rodwell was involved in the operation. He said: “I’d been up on the route on Thursday to meet the lead runner, a 32-year-old Spaniard, whom I had to help off the hill in a bit of a state with badly ice-damaged legs and exhaustion. “He was carrying a GPS tracker which was updating his position on the event website every few minutes, and a sharp-eyed team-mate from BSARU noticed very quickly that he’d descended from the Pennine Way a few miles too early. “I watched his trace for the next half hour, and when I saw how slow his progress was, and that he’d unnecessarily lost several hundred metres of height, which he then had to regain, I decided to run out and meet him. The weather then worsened, with blizzard conditions even at low level. 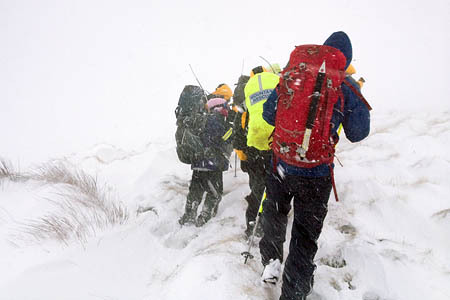 The scene up on the Pennine way was described by competitor Dave Lee, 66. “I’ve been going into the hills in all seasons for five decades, and I’ve seldom had to deal with anything like what we had to battle through on Friday night,” he said. Mr Lee was accompanied by Annie Garcia, who had travelled from Peru from the race, and Russell Swift, a youngster running only his second ultra-marathon. Mr Swift had been fitted with a GPS tracker by the event organisers, and they were fairly confident that he had made it to the refuge hut at Lamb Hill. They had no means of contacting him or either of his running mates, and therefore had no idea whether the group was still together, and what sort of condition they might be in. In the circumstances and with more severe weather forecast it was decided to call BSARU to evacuate them. Mr Rodwell said: “We assembled 13 members and set up a control base at Pennymuir in the Kale Valley, from where the operation and communications would be handled. “Our two Land Rovers were taken as far onto the hill as the ice and snow would allow, from where they would act as a communications relay to ensure that the hill-party was in constant contact with control. “Eight personnel were then deployed onto the hill from Buchtrig farm, from where we made our way up onto the Pennine Way. “Even clad in full winter gear, with ice-axes, winter boots and full waterproof body cover it was a struggle. Icy squalls of snow on a strong south-easterly wind combined with deep drifts to hamper our progress. 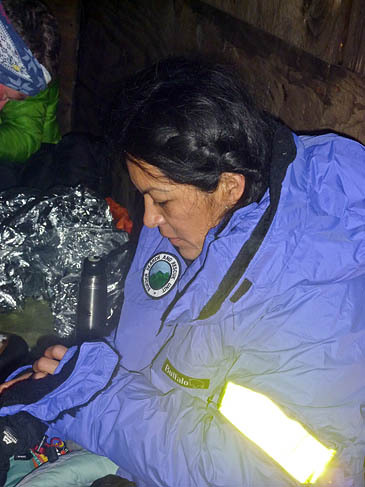 “We arrived at the hut to find all three runners safely huddled inside. They were pretty well equipped for general hill conditions, but the battering they’d endured the previous night had left them soaked to the skin, cold and exhausted. “The fact that Mr Lee led them across some extremely bleak country in a night-time blizzard is a truly impressive example of navigation. Bear in mind that all three had covered about 250 miles over rough country in the middle of winter in the previous seven days. “I take my hat off to them. At the same time, a larger group of five competitors were holed up in the refuge hut at Auchope. As BSARU was fully committed on the Lamb Hill incident, Tweed Valley MRT was asked to come and assist. They were busy providing cover at the Feel the Burns race at Selkirk, but were able to send a vehicle and five members to Kirk Yetholm to ensure that this group made its way to safety. Two BSARU members intercepted the runners coming off the hill at Halterburn Head while the TVMRT contingent were asked to cover the descent from the high-level alternative in case the runners had taken that route instead. “It was a very satisfactory conclusion to what could have been a very complicated incident”, added Mr Rodwell. 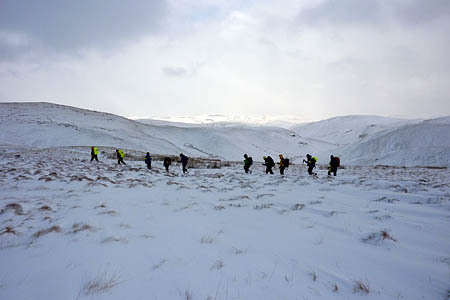 “We’re very supportive of people who decide to test themselves in the hills, as long as they equip themselves with the appropriate clothing for the conditions and the requisite knowledge and fitness for the challenge they are tackling.